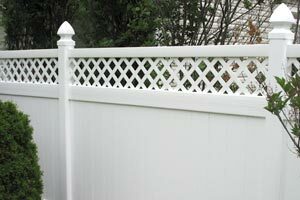 Any Vinyl PVC Fence of $4,000 or more. When considering building a privacy, semi-privacy, picket or post-and-rail fence on your property, your choice of materials has an impact on the overall cost, but shouldn’t be your only criterion. Costs, though, are comparable for all types of materials. 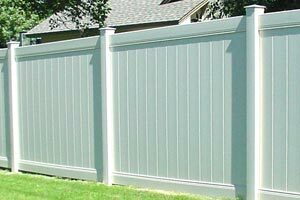 If you’re considering a vinyl fence from Bufftech, you should know that even though it can be a bit more expensive than a similar wood fence, its endurance and other characteristics are superior to wood in a number of ways. The initial cost the product should be weighed against the life expectation and maintenance requirements of each material. The cost per year over the lifetime of the competed installation is the only true measure of value. Type – Design type of fence you’re planning has a large effect on price. PVC vinyl privacy or semi-privacy fences use more materials than picket or post-and rail fencing and are more expensive for the same length of fence. Height – Bufftech Vinyl privacy and semi-privacy fences are available from 4′-8′ in height. Picket fences can be from 3-5′ tall, while post-and-rail fencing is available in low 2-rail or higher 3-rail designs. Taller fences generally cost more than shorter ones. Design – For each type of vinyl fence, Bufftech offers a wide range of styles, each with different details and complexity. Prices vary, depending on the features of each style. By selecting a style that matches both your design sense and budget, you can control the total cost. Gate Choices – Gates are part of every fence, and Bufftech makes matching reinforced gates for every style and design they offer. The width and number of gates you choose will affect the total price. In most cases, you can also choose plain or arched gates. Each is priced individually. Accessories and Options – For each type of vinyl fence, optional decorative post caps are available, with each priced separately. In addition, you can also choose special gate hardware at additional cost or even lighted post caps for a wonderful touch. Installation – PVC fencing is easy to install, with 8′ wide fence panels and simple assembly techniques. That makes it ideal for DIY installation. Of course, our experienced, meticulous installers can also build your fence for you, quickly and efficiently. Zero-maintenance PVC vinyl fences are increasingly popular with homeowners in Minneapolis St. Paul. Their long life, clean appearance, very reasonable cost per foot and fast installation make them an excellent choice that provides outstanding long-term value that enhances any property. They never need painting, won’t chip or crack, and have beautiful visual appeal. Ideal for DIY, this material is available in all popular types and styles. At our convenient Brooklyn Park showroom or in a free, on-site consultation at your location, we’ll be glad to show you every Bufftech model and option available and give you accurate, complete price quotes for your project, either for materials for you to install, or for a project professionally installed by us. We’ll also help you compare the costs of your fence with other materials to help you make the best choice for you and your property. Call us today to get started on this popular home improvement project.